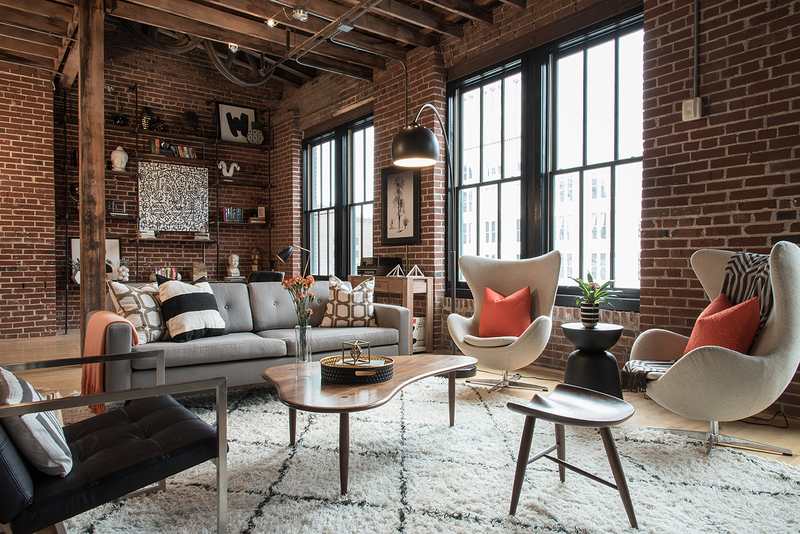 A young couple makes downtown their home in a contemporary industrial loft. “Downtown has always been my playground,” laughs homeowner Joe Benninger. “I love the pace, the bars and the people.” So when Joe and his girlfriend Kelly Lindsay began looking for a new place to call home, there was no question it would be in the city. Wanting to be off Washington Avenue and close to Culinaria, the couple fell in love with the Alexander Lofts building. Formerly the Spool Thread Building, which was built in 1906, the five-story structure has been developed into eight loft condos. “We looked at other places in the city, but nothing compared to this building,” Joe says. 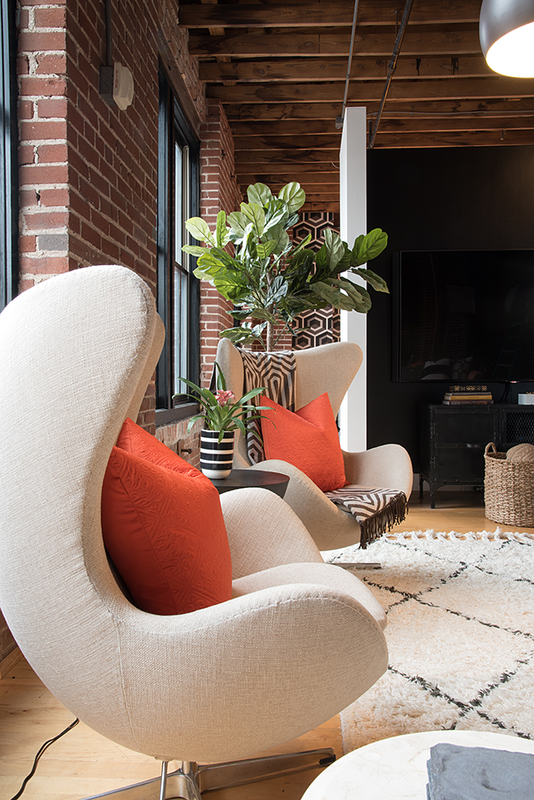 Joe and Kelly were fortunate to snag their unit before it even went on the market, and once it became theirs it was time to put their own personal style and twist on the space. 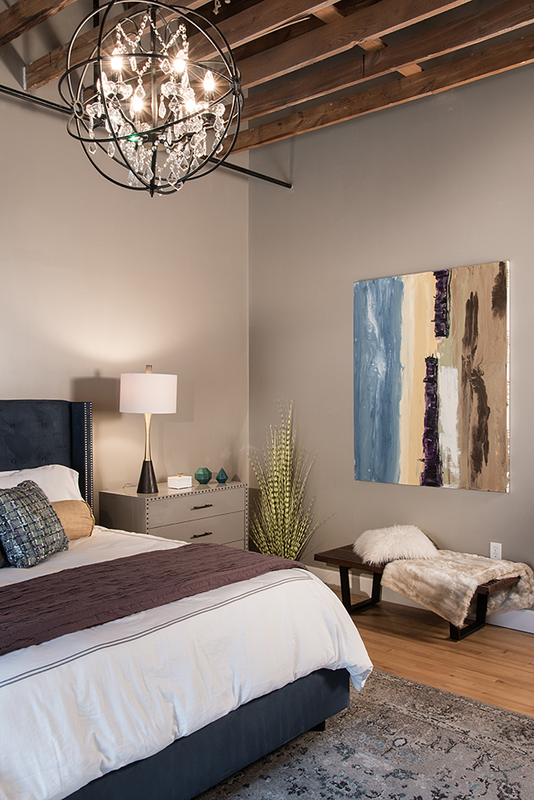 Starting with a blank palette, the couple bought all new furnishings and artwork. 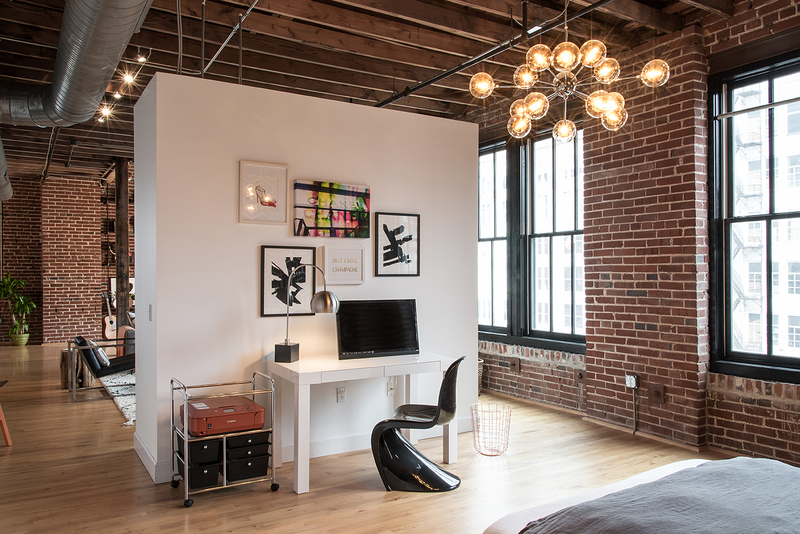 Combined with fresh paint and new light fixtures, the completed loft is a fun, eclectic mix of contemporary, modern and industrial styling with a gray, white and orange scheme. The elevator from the lobby takes the homeowners and guests directly to the unit. Stepping off the elevator you are greeted by an expansive bar made up of three wood-topped tables with metal legs. Above the bar is an impressive photo of Central Park that Joe knew he had to have as soon as he saw it. “It’s an odd look at Central Park and the dimensions are so cool,” he says. 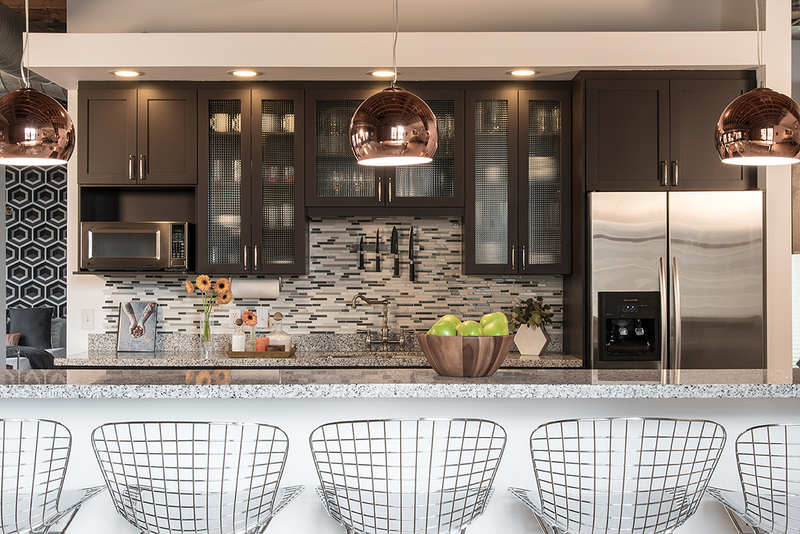 Just on the other side of the kitchen island, the loft’s dining room is a fun place to entertain guests. An expansive 9-foot Ajax dining table by Martin Goebel, Goebel Furniture Co., was custom built using white oak. The post timbers are reclaimed from a 120-year-old barn in Farmington. Joe and Kelly wanted a table with character, something rough, but not too polished. The size was also important. 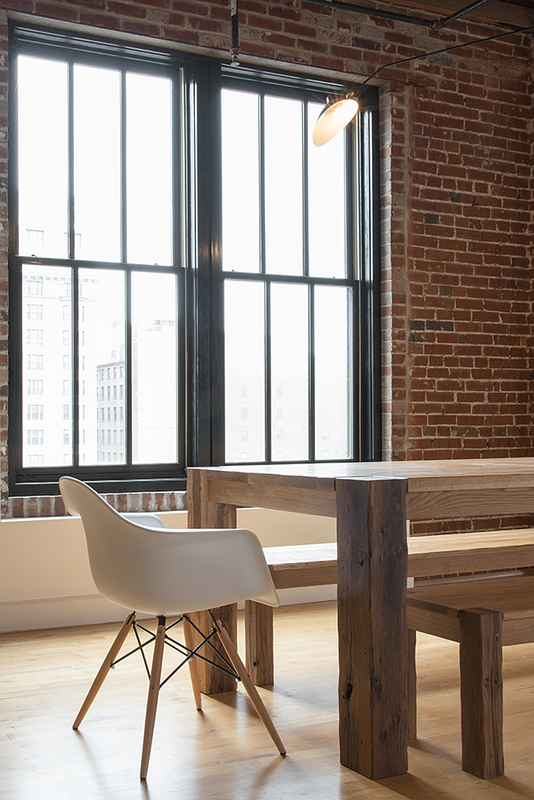 “Since the kitchen island is so big, we needed a large-enough table to complement the size,” Joe explains. A small library nook is tucked to the side of the open kitchen, dining-room and living-room concept. Kelly and Joe installed the metal-piping bookshelves that display personal trinkets and accessories. 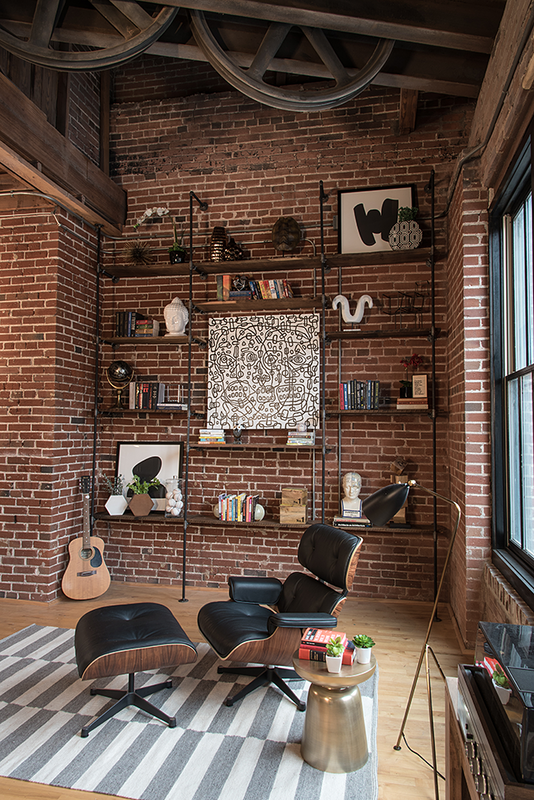 The metal is a nice contrast to the exposed brick wall. 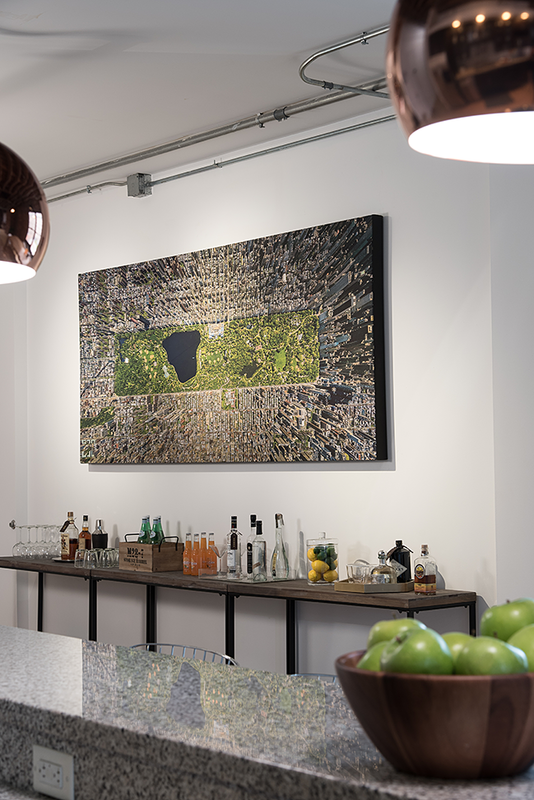 A black-and-white painting by local artist Ian Quattrocchi anchors the space. In the ceiling, the original pulley system for the building’s original freight elevator adds a cool, industrial touch. The adjoining living room is the epitome of sleek and contemporary and proves that the modern look can be cozy and cool at the same time. “It was such a compliment when a friend said, ‘Your furniture is so much more comfortable than it looks,’” Joe says of the arrangement. A dove-gray sofa and cream egg chairs dotted with pops of orange pillows continue the gray, white and orange scheme of the loft. A Remy table by Goebel Furniture Co. makes for an ideal coffee table. Joe and Kelly took their time picking and choosing furniture, artwork and accessories. “I look and look until I find what I want,” Joe says. 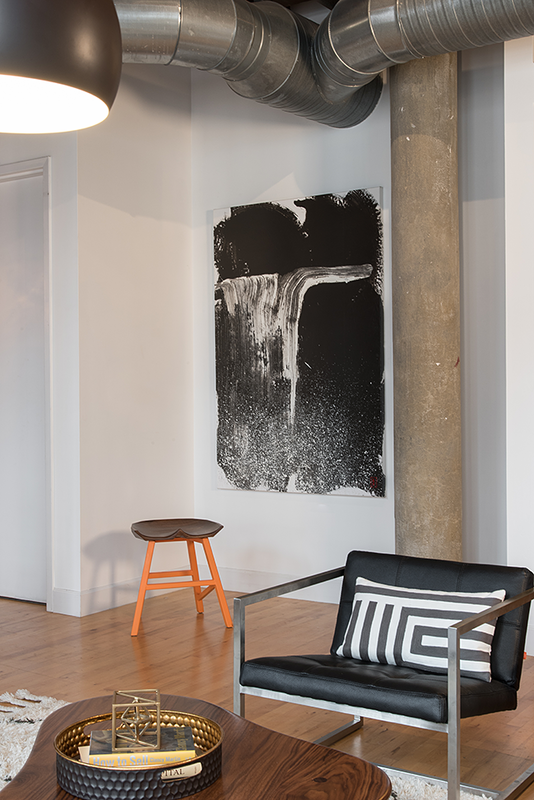 “I won’t just settle for any item.” Underneath exposed ductwork and next to a cement column is an abstract black-and-white painting by local artist Paul LaFlam. A partial wall that Kelly and Joe painted black separates the living room from a guest bedroom behind. 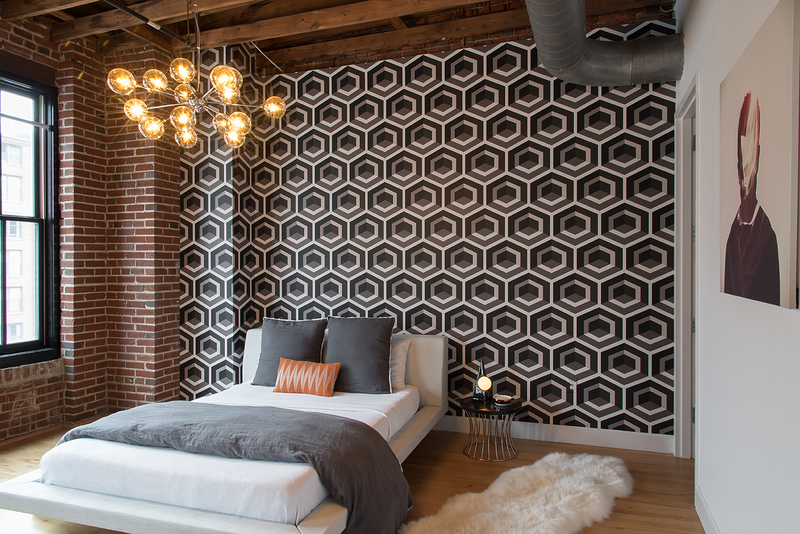 Visible from the living room, the homeowners knew the back guest-bedroom wall needed to be bold and visually interesting, so they selected a black-and-white hexagon-patterned wallpaper that pops off the wall. “I was very hesitant about wallpaper when the idea first came up, but I love this print,” Joe says. Another space Joe gave up design control was in the master bedroom. Letting Kelly take the lead, the cozy space features a midnight-blue upholstered headboard, another abstract by Paul LaFlam and a fun chandelier. “The chandelier was a must for Kelly,” Joe says. While slightly swaying from the more modern look of the loft, the master suite still retains the clean lines and subtle colors of the rest of the home. With the close proximity to restaurants, bars and sporting events, their new downtown location is perfect for the young couple. 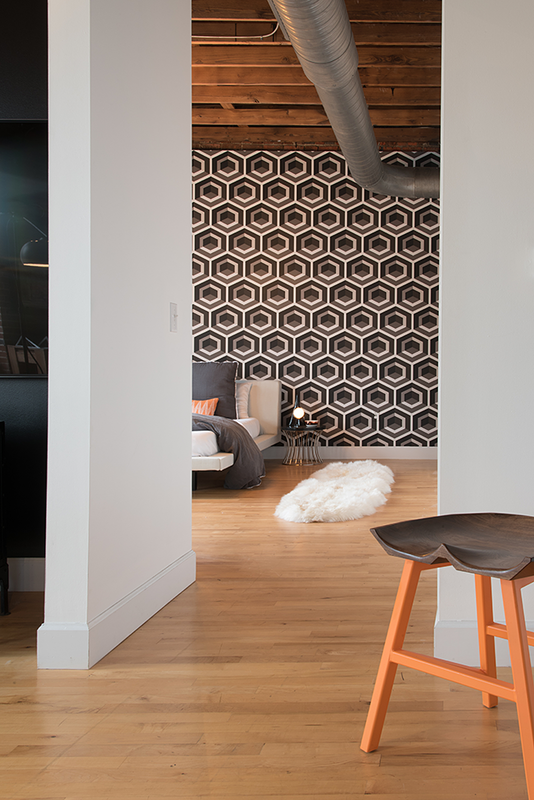 In their home for almost a year, Joe, Kelly and new family member Dakota, a Siberian husky, couldn’t be happier owning their chic loft in their own slice of the city.